Showing equally great respect for all the forms of art, even beyond acoustics, loudspeaker manufacturer Crystal Acoustics innovated by sponsoring Ilirian Shima’s sculpting exhibition. The exhibition took place from May 29th and through to July 2nd of 2006, by the Titanium Hall of Arts in Athens, Greece. Crystal Acoustics collaborated with sculptor Ilirian Shima to create the Melody speaker, which leaves a strong impression with its particular looks and top sound performance. The speaker inaugurated the company’s Sound of Art line. This line features not simple speakers but work of arts, promoting thus acoustics and the art of sculpting simultaneously. 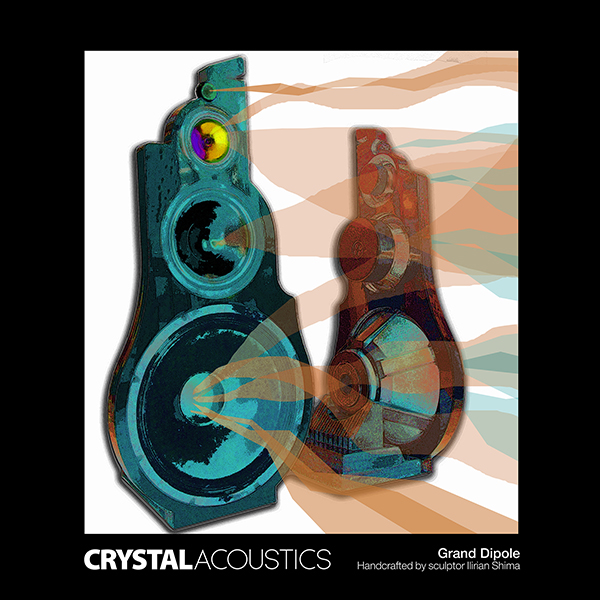 The second piece of this collection is the Ballad Subwoofer, also the result of Crystal Acoustics’s collaboration with Ilirian Shima. A radical look inspired by the musical instrument Bass, Ballad is specially designed to complement the Melody speakers, acoustically and aesthetically. Both Melody and Ballad speakers, are the sculptor’s creations for Crystal Acoustics and are presented at the exhibition, with their sculpture names, ISO and Ilir’s Ballad respectively. This collection includes fourteen of Ilirian Shima’s sculptures, crafted on plywood, black and white marble, wood, stone and bronze. For more information on The Sound of Art, check the relevant product page on this website.